Apple has confirmed plans to conduct more on-foot data collection for Apple Maps, going beyond the first efforts in San Francisco. Between Nov. 26 and Dec. 23, Apple's pedestrian recon team will be operating in the California counties of Alameda, Los Angeles, San Francisco, San Mateo, Santa Clara, and Santa Cruz, the company said on its website. So far the company hasn't announced plans beyond the state. 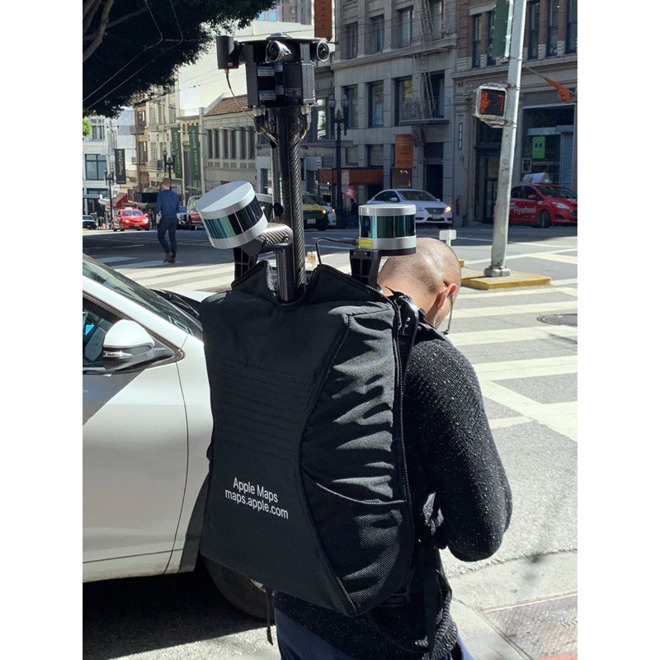 The first members of the team were spotted in San Francisco this October, carrying oversized backpacks with many of the same cameras and sensors found on Maps vehicles. Apple is presumably hoping to improve pedestrian and/or cycling directions, since Apple Maps often assumes people have to travel the same paths as cars. On a broader scale the collection should be used to build out Apple's first-party mapping data. Plans to migrate to first-party maps were announced last June, and could help solve problems caused by the current dependence on a mish-mash of sources. The iOS Maps app began its life using data from Google Maps, but Apple decided to jettison Google content with 2012's iOS 6. This led to havoc in the short term as the service was saddled with missing or inaccurate data, sometimes putting lives at risk.